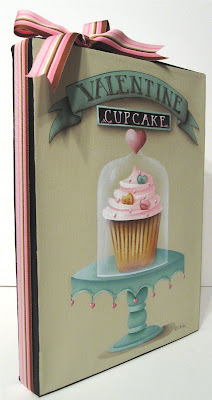 I finished this 9 x 12 inch Valentine Cupcake painting today and got it listed on eBay this evening. You can check out the auction here. 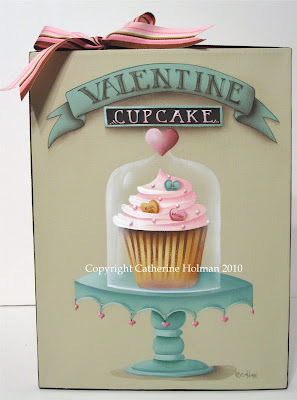 If you want a Valentine cupcake painting, this is the last one I'm doing this year. I just finished a cake painting for a customer who owns a cake decorating business in Australia. I will share that with you soon. I really wanted to keep that one for myself! A sweet cupcake for your special Valentine! This yellow cupcake is piled high with fluffy pink frosting and accented with heart shaped candy and white pearl sprinkles. This whimsical creation is displayed on a turquoise cake stand and covered with a glass cloche with a pink heart shaped knob. Tiny pink hearts hang from the edge of the cake plate. This cupcake could be my valentine(he he). Another beautiful cupcake Catherine...good enough to eat. The pinks and teals are so nice for this Valentine. Looking forward to seeing the one that you wanted to keep for yourself...you do have one or two for yourself, don't you? I love your cupcake and dessert designs. Do you sell painting patterns for the? Cathie, I remember last years Valentine cupcake and I thought that was my fav-I have now made this one my fav! Good job! Your paintings are so pretty and detailed. The cupcakes look delicious! Almost too pretty to eat!